Having a successful business is important but where you have them is just as important as the business itself. Then, what is your best business hotel in Seoul? Global travel magazine Travel + Leisure announced "World's Best Business Hotels" in 103 cities worldwide in its November issue, which was surveyed among T+L business travelers. Famously known as trendy and sophisticated business travelers, T+L readers chose The Shilla Seoul as the best business hotel in Seoul City. The best business hotel means more than just being the venue to sign papers. Quantitative and qualitative service and facilities within authentic contemporary details completes the hotel as being the best for business as well as pleasure. Today, businessmen travel smart and have increasingly sophisticated expectations when it comes to the quality of a hotel. They carefully consider and review from guest rooms, restaurants, service, restaurants, location, amenities and concierge to every minor detail you can name; use best judgment to choose best business hotel. The best business hotels in each of 103 cities were selected by best judgments. Just to name a few winners, St. Regis Hotel (Beijing), Mandarin Oriental (Hong Kong), Four Seasons (Singapore/Shanghai) and Park Hyatt (Tokyo) were chosen as the best business hotel. 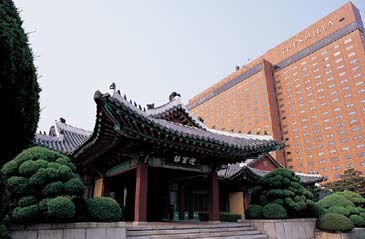 The Shilla Seoul stands together along the global hotel groups and once again proved its renowned reputation. What do they have in common as the best business hotel? They offer the best combination of location, accessibility and quality of venue. Attentive staffs stand next to hotel guest every second to service personal needs, state-of-the-art meeting venues and technical services are dedicated to business, most lucrative location, flexible facilities, ultimate taste served by the best restaurants and wellness treatments for pleasure. The core commonality is the unique blend of authentic sense and contemporary details. The top hotels fame was not built in a day just like The Shilla. It was developed over the tradition and well harmonizing with the present through fully embracing changes and moving on every moment to go beyond the best. The winners of 'World's Best Business Hotels' including The Shilla Seoul also ranked in the Travel + Leisure's 'Top 50 hotels in Asia' list announced in August and The Shilla was the only hotel to be honored in the Top 50 from Korea. The Shilla Seoul is the answer to make your travel and business successful in Korea. Since 1979, South Korea's premier lifestyle destination The Shilla Seoul set a trend in luxurious lodging boosts authentic modernism with state of the art facilities, high-end technology, and subtle and dedicated service. Being close to the city's main banking and financial centre, offering every conceivable guest amenity, including five international restaurants, award-winning fitness club, state of the art business centre with private meeting rooms with tele-conferencing facilities, luxuriously appointed rooms and suites, including Executive Floors and one of the largest hotel convention facilities, The Shilla Seoul is the perfect hotel for business travelers. The Shilla is one of Asia's most admired hotel groups, with The Shilla Seoul consistently voted South Korea's top hotel by international polls including Conde Nast Traveler's prestigious Gold List of the 'World's Best Places to Stay', Zagat Survey, Euromoney and other business and travel related media.